Local farmers sell fresh produce and fruit, among other locally grown goods; musicians busk along the street, serenading strangers with live tunes; residents stroll between booths which offer everything from fresh-off-the-vine vegetables to knife sharpening services. Palo Alto’s pop-up weekend farmers’ markets are hubs for members of the community. 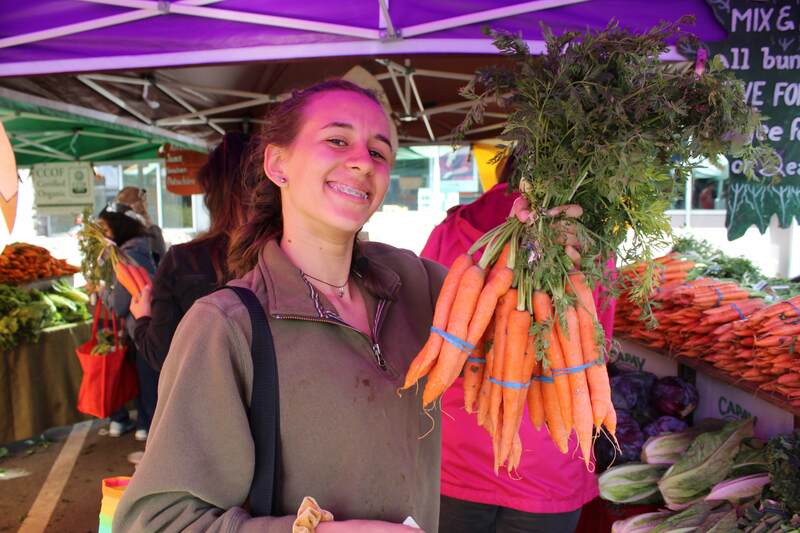 Palo Alto High School freshman Natalia Cossio is a frequent visitor and long time shopper at the California Ave farmers’ market, and her family has bought the majority of their groceries here for many years. For Cossio, the sense of community is an added perk to the market. THE APPLE STAND Freshman Natalia Cossio hands money to junior Max Valasek as he weighs a brown paper bag of apples on an electric scale. Cossio’s family are frequent shoppers at the California Ave farmer’s market, and have gotten to know the vendors over time. “I know there are a few Paly students who work at stands here,” Cossio says. Choosing local food also preserves small, non-commercial farmland while reducing “food miles” — the distance food travels until it reaches the consumer. With the increasing awareness about global warming and climate change in the Bay Area, Palo Alto residents have turned to different ways to be more “green” for their environment. From renewable energy sources to raising backyard chickens, here are some ways Palo Alto community members are reducing their ecological footprint and making an environmental impact. For some, being environmentally friendly means small steps, not a goal which regulates their life. For others, however, being green is a lifestyle. For Palo Alto resident Sven Thesen, the latter is true. Thesen’s home is a certified platinum Leadership in Energy and Environmental Design, a zero net-energy house just blocks away from Paly. When building the structure in 2010, the Thesens’ main goal was for it to run on solely renewable energy and create zero waste in the process. CLEAN COOKING Sven Thesen puts a kettle on his induction stove. Thesen is the owner of a zero net-energy house, and suggests that getting an induction stove is a great first step to being more sustainable in everyday life. “I want to get the knowledge out to not be afraid,” Thesen says. “Big picture, the lights work, the stove works, it’s comfortable, I’m in a T-shirt and it’s mid-March. “It’s a passive house, which means that it doesn’t affect the environment in any way,” Thesen says. Using several solar panels installed on the roof, the house’s electricity comes entirely from the sun. The passive house design uses the positioning of the sun during the winter as solar power for heating. In the summer, it reflects the sun with its white roof, keeping the house cool even without air conditioning. Their house also includes new water-saving technology such as toilets and water heaters, helping them save water as well as electricity. Raising cattle and tending to a farm are hardly feasible endeavors in suburban life, but members of the local community have found other ways to live sustainably. Inspired by her grandparents, who are farmers in central California, sophomore Gretchen Berndt has raised chickens in her backyard for the last three years. It’s extraordinary how much they’ve succeeded from farming and it really inspired me to be like them. “Since I lived in Palo Alto, I couldn’t have an orchard, but I thought chickens seemed really cool,” Berndt says. Raising chickens is her way of helping the environment. They serve as efficient composters of food scraps, and letting her “chickens live a good life” subverts cruel tactics used by industrial egg farms. Raising chickens has also yielded other perks; building the coop with her brother and dad led to family bonding, and selling fresh eggs to her neighbors and friends provides Berndt with a source of income. Most of all, Berndt hopes to continue a longstanding family legacy. Berndt is one of a handful of students who have taken sustainability to the next level. Many of her peers at Paly, pulled together by their love of sustainability, have organized on-campus clubs. The Environmental Clubs Organization — comprised of Roots, Climate Vision and Zero Waste — frequently collaborate to bring eco-friendly activities to the school’s student body. Evan Baldonado, the senior behind Paly’s No Straw November challenge, is an active member in all three organizations. “During the month of November, those who are able to are encouraged not to use single-use, non-compostable straws,” Baldonado says. The challenge was one of Baldonado’s ways to get the greater public to get involved with the ECO clubs’ work. “[The goal is] to make Paly more sustainable, more environmentally aware,” says senior Galileo Defendi-Cho, a member of Roots Club. Sophomore Anya Lassila is a member of the Climate Vision Club, and believes that her peers in the club are representaties for student activism, encouraging their peers to increase their awareness. “We’re focused on education and action with representatives,” she says. According to Lassila, there are lots of ways that people can reduce their carbon footprint. The challenge was one of Baldonado’s ways to involve the greater public with the ECO clubs’ work. Sophomore Anya Lassila is a member of the Climate Vision Club, and believes that her peers in the club are representatives for student activism, encouraging their peers to increase their awareness. MARCHING FOR THE CLIMATE Senior Galileo Defendi-Cho marches alongside other community members on Forest St. in downtown Palo Alto. The march was organized by 7th grader Julia Zeitlin from Casitlleja Middle School. Marchers finished their protest in Congresswoman Anna Eshoo’s office. According to Lassila, there are many ways to reduce a carbon footprint. Many students, both in and out of clubs, practice sustainable habits. Tomz’s dedication is a testament to how all around Palo Alto, people from all demographics are making an effort to lead a cleaner life.